Bridgeport Condos are two mid-rise condominium buildings connected by a courtyard. Most units at Bridgeport have wood floors, modern kitchens and stainless appliances. Some corner units even have sought-after wrap-around balconies. 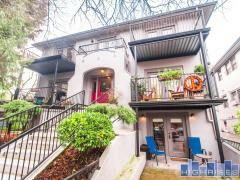 Located in the quieter end of the Pearl but with easy access to the Streetcar. Have any comments or questions about Bridgeport? Ask your question and/or share your thoughts about this Building. can we purchase a condo in Bridgeport as a rental unit? If you own a unit that comes with one parking space in the garage, is it possible to rent a second space? Hi Gerard - yes, you may be able to rent a second space. Generally, if another resident has a spot they're not using and would like to rent out, they will post an ad on the bulletin board in the building. Let me know if you have any other questions at all.